BROWNSVILLE — Hundreds of heartbroken friends and relatives gathered Friday to mourn Ronald Wallace, the 13-year-old Brownsville student gunned down last week. At a tear-filled funeral at Universal Temple Church of God on Eastern Parkway and Lincoln Place, Wallace was remembered as a model student and a dogged basketball player on his school team. 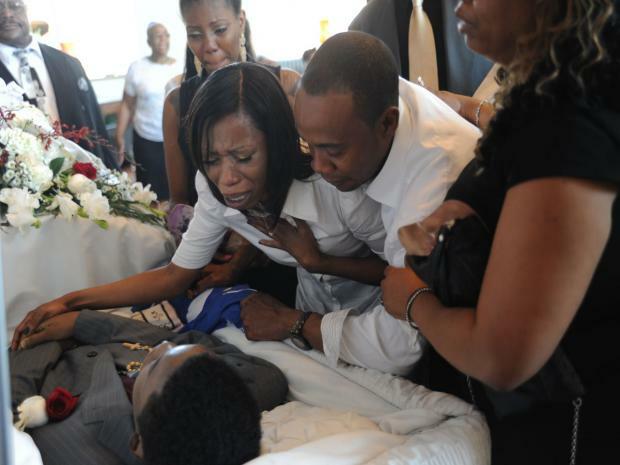 The teen's parents, Ronald Wallace and Tiffany Orr, bent over their son's open casket and wept as they held his hands for the last time. "The parents have not yet come to grips that their son is gone,” said Maxine Williams, 67, Wallace’s great aunt. “Tiffany, the mother, hasn't slept one day since this happened. That’s her baby, that’s her life. She lived for her kids." Ronald Wallace was shot in the back about 12:40 a.m. Aug. 24 at Tapscott Street and Blake Avenue, just a block from his home. He was taken to Brookdale Hospital, where he died. "Ronald was very cheerful. Very vibrant, full of life,” said Aarron Lewis, 24, Wallace's cousin, who sang "I Won't Complain" at the funeral. “[He was] so into basketball, like that was his job. A very bright young man." P.S. 323 Principal Linda Harris called Wallace, who just graduated in June, a model student, the "best of the best you can have." He had planned to start ninth grade at Richmond Hill High School next week. Wallace, whose nickname was "Ra-Smoove," also made a strong impression on his former basketball coach, Kareem McQuilkin, who said Wallace "gave his all, 100 percent" to the Canarsie Blue Devils. Even if Wallace was out of breath or exhausted while competing against bigger players, he never gave up or asked to take a break, McQuilkin said. "We didn't have to tell Ron to work hard," McQuilkin said. "He had that within himself." The Rev. Tracey Henderson, who led Friday's funeral service, urged the mourners to celebrate Wallace's life and remember that he is in a better place, a sentiment many of his relatives echoed. Joseph Watson, 45, a cousin who spoke at the funeral, called the experience "surreal." "I was touched that a lot of people came out and showed their concern and admiration for him," Watson said. Russell Simmons sent a condolence card to the family, relatives said. Police have not made any arrests but released a photo this week of a suspect, 17-year-old Akbar Johns, wanted in connection with the shooting. “I want justice for him,” said Williams, Wallace's great aunt. Rosalinde Kandell, 54, a friend of Wallace's family, said she was distressed by the violence. "The kids are out of control with the guns, and to see a close friend lose their grandchild, it hurts — it hurts deeply," Kandell said. "He was a good child and now he's gone over some stupidness of another child. They [were] children, both of them. It was unnecessary. It shouldn't happen." Anyone with information about the shooting is asked to call Crime stoppers at 1-800-577-TIPS (8477). The public can also submit their tips by logging onto the Crime Stoppers website at WWW.NYPDCRIMESTOPPERS.COM or by texting their tips to 274637 (CRIMES) and entering TIP577. All calls are kept strictly confidential.